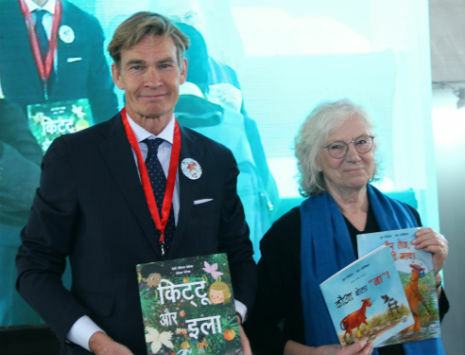 New Delhi, 09th January 2018: It was a memorable event for children present at the Children’s Pavilion at the New Delhi World Book Fair 2018, as 3 famous Swedish children’s books were released in Hindi by H.E. Klas Molin, Ambassador of Sweden to India and renowned Swedish author Jujja Wieslander. The launch was followed by gaving away signed copies to the interested children. The books released today are: Mera Fart Mamma Mu ( Aur tej kajari Gaay) and Kråkan säger INTE ( Kavva Bola Na! ), both written by Jujja Wieslander and illustrated by Sven Nordqvist and Kalle Och Elsa ( Kittu Aur Ila) by Jenny & Jesus Verona. The Mamma Moo series is about a talking cow and her best friend, a crow from the nearby woods. The series is loved by children across the globe and translated into over 30 different languages. The Mamma Moo series has 10 titles – of these 8 are available in India in Hindi and 2 in English. Jujja Wieslander is a Swedish children’s book author and member of the Swedish Children’s Book Academy. Mamma Moo is her best known series and has travelled with different languages in Europe. The stories have been made into radio shows and a children’s film. These have been incredibly popular winning several honours and awards. “Children’s literature is very close to our hearts, with many strong characters embodying the rights and possibilities of every child. They enable us to talk about both fun and difficult subjects in a natural and approachable way.